Greek Study – King James Only? On February 1st, Dan Wallace debated Bart Ehrman, for the third time, on the reliability of the New Testament text. 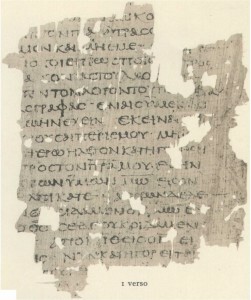 In this third debate held on Ehrman’s own UNC Chapel Hill, Wallace mentioned the possible discovery of a 1st century fragment of the gospel according to Mark. Subsequent rumors have revealed that this is a fragment, dated by a neutral party, older than P52. Wallace has made some comments at various blogs to assure us that he was neither the discoverer not the examiner of said document, but was merely reporting news. A book is expected to be published next year that will detail more information. Some bypassing comments on the Internet suggested that, if validated, this discovery can be a mighty blow to the arguments of Ehrman as well as the arguments of King James Onlyism. While I think such an old fragment will carry much significance, I think both sides will be able to continue to their respective positions regardless. Check out the website of the Center for the Study of New Testament Manuscripts for updates (as of this blog, no update has been given). Also, check out Evangelical Textual Criticism periodically for possible updates. My recent post on listening to the New Testament in Greek via MP3 has sparked quite a bit of excellent discussion. I’d like to particularly thank Dr. Maurice Robinson for chiming in and sharing his perspective. His recording of the Byzantine Textform is available here and is, in my opinion, one of the better Erasmian pronunciations out there. There are a lot of great options available, but I will reproduce just the list of available online MP3 formats. You can head over to the Let’s Read Greek site to get the breakdown of which one represents what. Some of these require payment, but the majority are available for free download. My personal preference is for the pronunciation used by John Simon (#3), although I would prefer that he were reading something other than the W-H. If I had my choice, I would do Randall Buth’s immersive course. There are probably some other resources out there, but Sorenson has done a great job of bringing together some of the best for us. Be sure to head over to letsreadgreek.com and browse around.